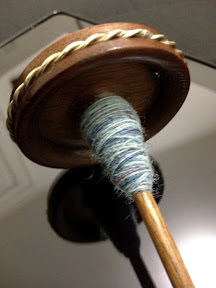 circular sock machines, spinning, knitting, quilting, sewing, fleece carding, wool dyeing, weaving, rollerskating, all the while being V.
Yes, you heard it here first. This Apple girl has gone Android! No, I'm not abandoning Apple. I just feel that this particular phone is a better fit for me at this stage of my life. 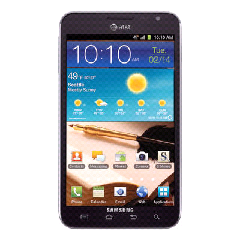 This is a huge phone, but its more than just a phone. Its a tablet hybrid. Its a stunning 5.3" vividly bold screen with stylus (called an S-pen). additional monthly expense. Who wouldn't love that? 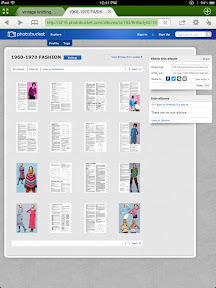 Be sure to check out Britlady52's very generous collection of free knitting machine patterns and manuals online. Theres info for dozens of machines. Thanks Britlady52! It Spoke To Me, I Swear! 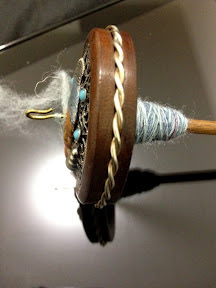 I should have been getting ready for bed, but instead I chose to check out the "Used Knit and Spin Equipment" group on Ravelry. 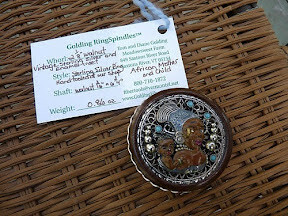 I'd recently sold one of my Golding spindles through the group, a pretty Celtic design that I purchased at Rhinebeck from its maker, Tom Golding. 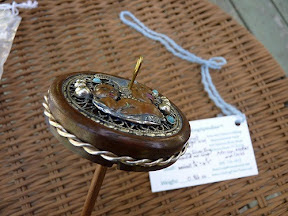 It was much more of an impulse buy than a need and I just never bonded with the little guy (I mean the spindle, not Mr. Golding). 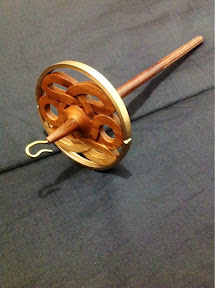 So, I sold it to a 1st time Golding spindler. I hope the two are happy together. 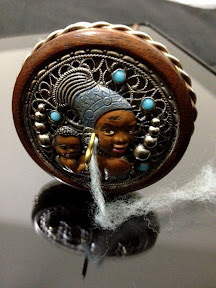 It's an "African Mother and Child" ring spindle with antique sterling silver ring and accents. I learned from the seller that it was purchased on Mother's Day last year. It's so ironic that a year later it should become my Mother's Day gift to myself. My new-to-me knitting machine has arrived! 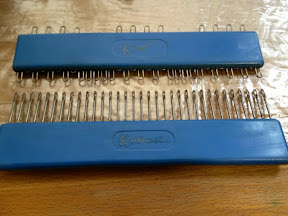 It's a KnitKing 4000 (at least that's what my research suggests), which is very similar to a Knitmaster 4500. 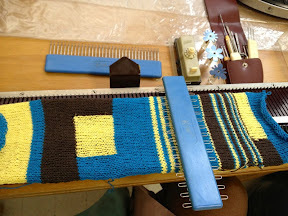 It's the perfect machine for intarsia knitting. 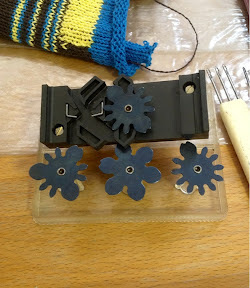 I simply lay the yarn across the needle hooks and slide the carriage across the bed. Changing colors is as easy as grabbing a yarn end. It's that simple and I love it. The machine came with some great tools too. Having two of each triple and double transfer tools make for easy cable knitting. 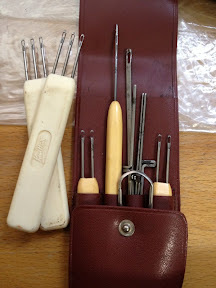 Multiple transfer tools: this one capable of handling 33 stitches! 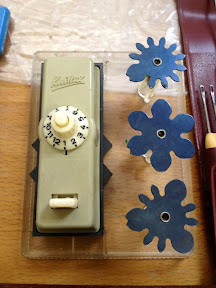 The other is an adjustable needle pusher capable of pushing up to 33 needles in any configuration. Although the machine did arrive with some damage and the incorrect needles (which I repaired and the seller rectified) I'm delighted with this new machine. Random people who surprisingly enjoy reading my blog. The Sew Box - "Sewing Treasures"